Please complete registration form in its entirety. If you have any questions, ideas or concerns, please speak with Youth Ministry Coordinator. 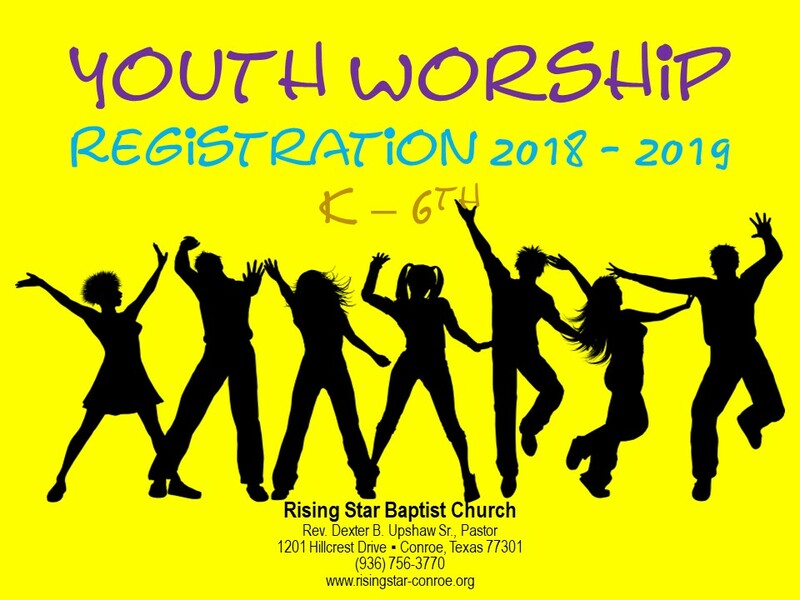 As parent and/or legal guardian, I remain legally responsible for any personal actions taken by my child/children and I hereby release Rising Star Baptist Church, its staff and volunteer workers from any and all liability due to any injury, loss, or damage to person or property that may occur during the course of this event. I give permission to Rising Star Baptist Church, its staff and volunteer workers to render first aid, should the need arise. In the event of an emergency, I also give permission to the physician, selected by the adult leader in charge, to hospitalize, secure proper anesthesia, order injections, or secure other medical treatment as needed. I grant permission for him/her to participate in the RSBC Youth Worship Rally. I grant permission for him/her to be photographed during activities to be posted on gym bulletin board or used in Youth Ministry advertisement. I agree that while my child(ren) are in attendance in Youth Worship that they will abide by the following rules: Respectful to adult leaders, volunteers other youth and will cooperate with the schedule of events and participate in all activities as directed; Clean up after themselves; Respects other's desire for personal space and keep their hands to themselves; Remain quiet and respect others when they are speaking; Respects God's house and will not curse, use racist slurs, name calling, put others down or make fun of anyone; Respect church property and refrain from any horseplay, throwing, running or chasing others and Will not exit the building or gym at any time unless in case of emergency or if directed to do so by a youth leader or volunteer. I agree to all. I do not agree to 1, 2 or 3 and need to speak with Youth Ministry Coordinator regarding my concerns.